The BCF Managers by KUBUS add BIMcollab® connectivity as well as BCF file support to Autodesk® Revit®. It provides the ability to create and modify issues and communicate these through BIMcollab or via BCF files (supports version 1.0 and 2.x) directly from within Revit. The BCF Managers are available for other popular BIM tools such as Navisworks, ARCHICAD, Solibri Model Checker, Tekla Structures and simplebim. Together with our web application, these form the BIMcollab® issue management ecosystem which provides an effective way to communicate BIM issues and thereby providing a more efficient workflow. BCF files support is also included for working with BIM applications which support BCF natively such as Tekla BIMsight, DDS, MagiCAD and many more. Issues will contain title, description, status, who's responsible, recommendations or suggestions, and whether a resolution has been implemented. Using BIMcollab® will additionally allow you to add area information, milestones, deadlines as well as implement a formal approval process. All issues can contain viewpoints with camera position and relevant objects. This allows you to zoom-to the issue-location, highlighting the problematic components in whatever BIM-tool you are. A free BIMcollab account is included with the BCF Manager. 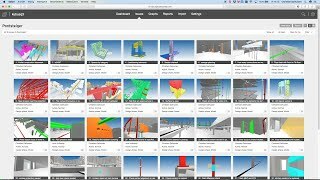 You can publish and manage issues in the cloud, and share them with others directly from the Revit/Navisworks plug-in or using the web interface. This app is really helpful for people working within the team and different location. I love to use this app. Really good product which shows what BCF can do. Includes web based coordination (free use with limits and an account).